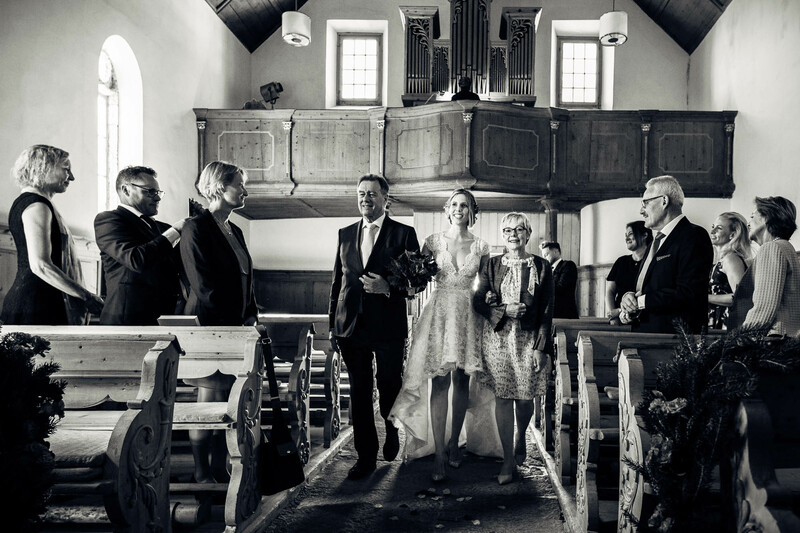 As wedding photographer in the Engadine I was allowed to accompany the bridal couple Severine & Gion at the civil as well as at the church wedding. 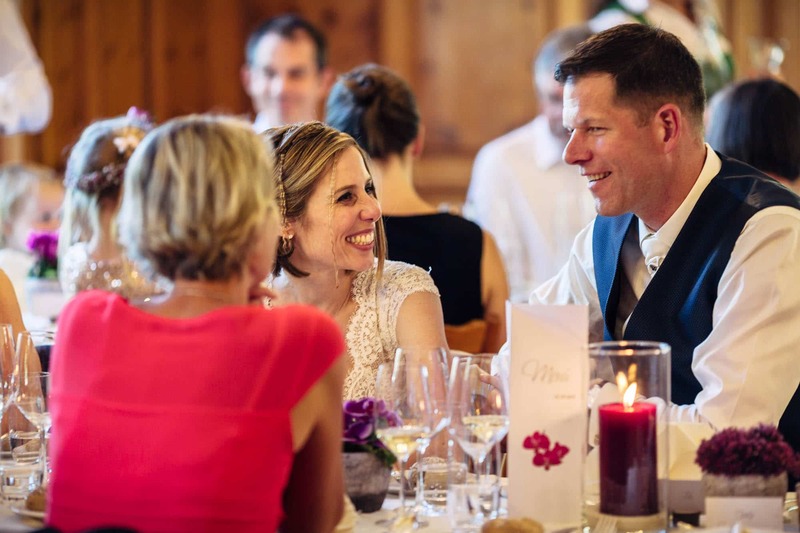 On Friday they married civilly in the close family circle at the registry office in St. Moritz. Afterwards the company walked to the nearby restaurant Lej da Staz. Lunch was excellent. There was a relaxed and very cosy atmosphere. Unfortunately the weather was very cloudy and rather fresh, but we were able to take nice couple photos directly at the lake on the jetty. The first picture shows it exactly. Cloudy, cool and already a little mystical. Really high contrast. Quite different then the next day, Saturday. Almost steel-blue sky and sunshine. It was warm and not to compare with Friday. It is already at the beginning of September. Autumn is a dream in the Engadine! Beautiful how the autumn colours show up and the larches slowly change colour. Severine had herself styled at Cuafför Nova in Scuol. She was accompanied by the ring girl and her sister. The bride’s father went shopping in the meantime. Gion prepared himself in the suite at the Hotel Meisser in Guarda. From there you have a beautiful view of the village and the mountains on the other side of the valley. 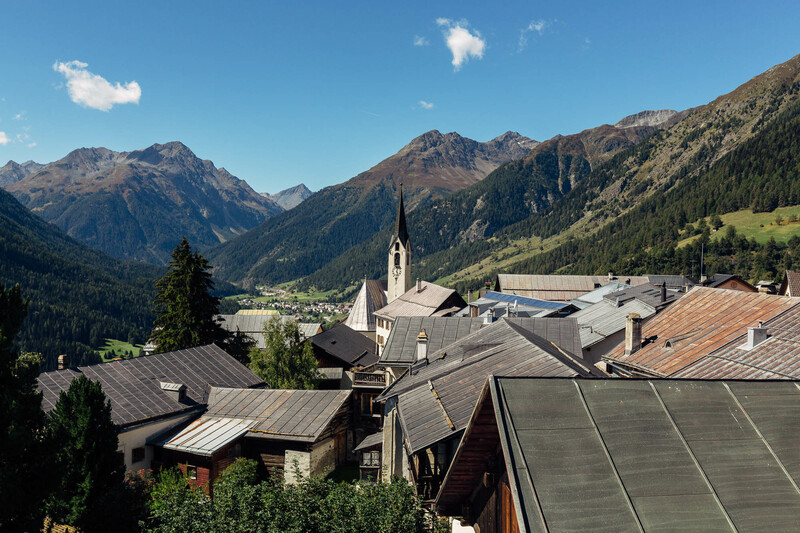 By the way, the small village Guarda is known far beyond the Engadine. It is the scene of the children’s book “Schellenursli”. The church wedding ceremony took place in the church in Guarda. A special feature was that a female pastor performed the wedding ceremony. For the rich aperitif, lunch and dinner the wedding party changed back to the Hotel Meisser. It is only a few minutes’ walk from the church. A heartfelt thank you, Severine & Gion, for allowing me to accompany you as wedding photographer in the Engadine.